Some 550 years before the birth of Christ, the Lord told the Book of Mormon prophet Nephi that He would “remember those who are upon the isles of the sea” and that He would “bring forth my word unto the children of men, yea, even upon the nations of the earth.”3 To many who have read these choice words, one group of “isles of the sea” in particular comes to mind: the Philippines. The Republic of the Philippines is a large archipelago of about 7,100 islands located off the southeast coast of Asia. With a population of more than 92 million, it is a beautiful tropical country populated by a friendly, lively, and humble people. Yet the country is prone to earthquakes, typhoons, volcanic eruptions, tidal waves, and other natural disasters, and suffers as well from a host of socioeconomic problems. Widespread poverty is a recurring challenge, and Filipinos have endured bouts of political instability and economic crisis. But to those who are familiar with the Lord’s ways, the Philippines is fertile ground for the planting of gospel seeds. Apart from Tagalog and other native languages, many Filipinos speak English, which is also a national language. More than 80 percent of the population is Christian, due to a long period of Spanish rule, with a significant Muslim minority. The first attempt to introduce the Church in the Philippines was made in 1898 during the Spanish-American War by Willard Call and George Seaman, LDS servicemen from Utah, who had been set apart as missionaries prior to their departure. As opportunity arose, they preached the gospel, but with no apparent success. During World War II, several LDS servicemen moved through the islands with advancing Allied forces. In 1944 and 1945, servicemen’s groups held Church meetings in many locations, and numerous LDS servicemen and service workers were still in the Philippines when the war ended. Among them were Maxine Tate and recent convert Jerome Horowitz. Both were instrumental in introducing the gospel to Aniceta Fajardo. While helping rebuild Fajardo’s house in a bombed-out area of Manila, Horowitz shared his newly found faith with Aniceta and her daughter Ruth. Aniceta gained a testimony and desired baptism, but the Church did not authorize baptisms for Filipinos at that time because there were no permanent Church units in the islands. Elder Harold B. Lee of the Quorum of the Twelve Apostles became aware of Aniceta’s desire, and in early 1946, in his capacity as chairman of the LDS Service Men’s Committee, Elder Lee approved Aniceta’s baptism. On Easter morning of 1946, Aniceta Fajardo was baptized by serviceman Loren Ferre and is now acknowledged as the first known Filipino to become a member of The Church of Jesus Christ of Latter-day Saints. After the war years, Church groups were organized in two U.S. military bases at Clark Air Field and Subic Bay, as Latter-day Saint servicemen looked forward to the establishment of a more formal Church presence in the Philippines. On August 21, 1955, President Joseph Fielding Smith (1876–1972) dedicated the Philippines for the preaching of the gospel. Legal restrictions, however, would delay the arrival of missionaries for several years. 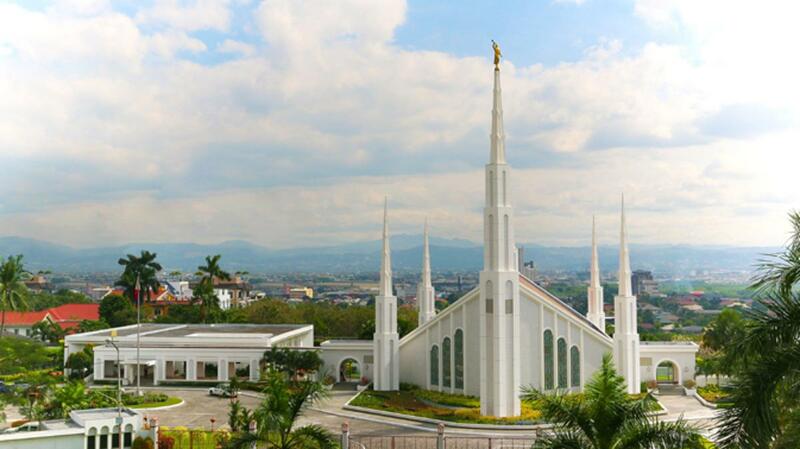 Then in 1960, Elder Gordon B. Hinckley (1910–2008), then an Assistant to the Quorum of the Twelve Apostles, visited the Philippines for several days: “I expressed the view that missionary work will be . . . fruitful as it has been in many other places in the world.”4 The following year, after much preparation and paperwork done by members such as Maxine Tate Grimm and President Robert S. Taylor of the Southern Far East Mission as well as friends of the Church such as Colonel Edward Grimm (Maxine’s husband) and Filipinas “Ping” Batchelor, Elder Hinckley returned to the islands to rededicate the islands for the commencement of missionary work. On April 28, 1961, in the outskirts of Manila, Elder Hinckley met with a small group of servicemen, American residents [Church members? ],  and one Filipino member—David Lagman—and offered a special prayer, asking the Lord “that there shall be many thousands who shall receive this message and be blessed thereby.”5 Those words, uttered by a true servant of the Lord, soon became prophetic. The first four missionaries, Ray Goodson, Harry Murray, Kent Lowe, and Nester Ledesma arrived in Manila several weeks later. “The Filipinos accepted the gospel very readily,” Elder Lowe noted. “When the head of the family decided to join the Church, in many, many cases the entire family would join the Church.6 Among the first members were Jose Gutierrez, Catalino Brocka, Filipinas Batchelor, and Nenita Reyes. American Church members and their families based in the US military bases in Clark and Subic.